As someone who is new to gardening, you are probably still learning everything about caring for your garden. While it can seem complicated at first, once you get to grips with everything, taking care of your garden is easy. For many new gardeners, one thing that they struggle with is caring for plants in pots. It might seem simple, but ensuring that your potted plants are as healthy and happy as possible, can be confusing if you are new to gardening. 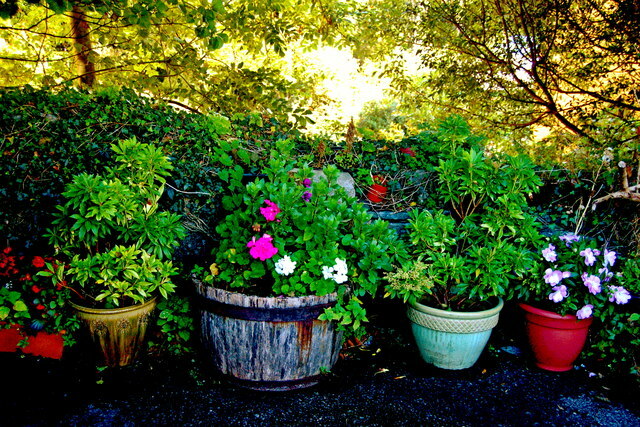 When it comes to choosing pots for your potted plants, it’s a good idea to be a little picky. You see, if you want your potted plants to grow well, there are a few things that you need to consider when choosing a plant pot. The first, and most important, thing that you need to know is that you should always make sure that you opt for plant pots with holes in the bottom. If you don’t, the roots of your plants could die, as they water would be unable to drain. Don’t make the mistake of using soil from your garden to fill your pots, instead invest in soil from a gardening store. The reason that you shouldn’t use soil from your garden is because it could have seeds already in it, as well as fungus. When it comes to choosing potting soil from your local garden store, opt for a brand that has peat moss and decomposed organic garden matter. Some plants prefer certain types of soil, so before planting, it’s always worth checking this, to ensure that you get the right soil. While it’s a good idea to choose plants that you like the look of, there are some other important factors to consider. The most important thing that you need to do is take into account the conditions of your garden. For instance, if your garden only gets a couple of hours of sun a day, don’t try to grow a plant that requires six hours of sunlight, such as a rose. Do lots of research and don’t be afraid to ask your local garden store for advice when it comes to choosing the right plants. Once you have planted each plant, it’s important that you know how to care properly for them. You need to know simple things like how often they need watering, feeding, and pruning. You can find all of this information out by investing in a gardening book or looking online. It’s also important to ensure that you have everything that you need to take care of your potted plants. This includes investing in the right plant food, a pair of good quality pruning shears, such as Felco pruning shears, and a watering can. As well as pruning back plants and shrubs that need pruning, don’t forget to deadhead. Deadheading is where you pinch off dead flowers from plants – this is important as it encourages them to grow more flowers. Many new gardeners make the mistake of thinking that caring for potted plants is tricky, but if you do adequate research, it doesn’t have to be. To help you get off to the right start, make sure that you follow the simple tips in this guide.